According to new estimates from eMarketer, Amazon will own about 44 cents out of every e-commerce dollar spent in the US this year, up from 38 cents the previous year. Amazon is on a path to being responsible for 50% of US e-commerce. Amazon’s e-commerce sales are expected to grow to $196.8 billion in 2017. This figure includes sales made by marketplace sellers, an often forgotten part of Amazon’s GMV. It is estimated that globally the marketplace accounts for more than half of Amazon’s GMV already. Since Amazon only reports their own sales their total share of the market is commonly grossly underestimated. eMarketer then adds that eBay contributes 6.8%, followed by Apple, and Walmart. Their data only includes public companies, as estimates for private companies are unavailable, or unverifiable. What is interesting in this, outside of Amazon being the leader, is that marketplaces are the biggest contributor to US e-commerce. 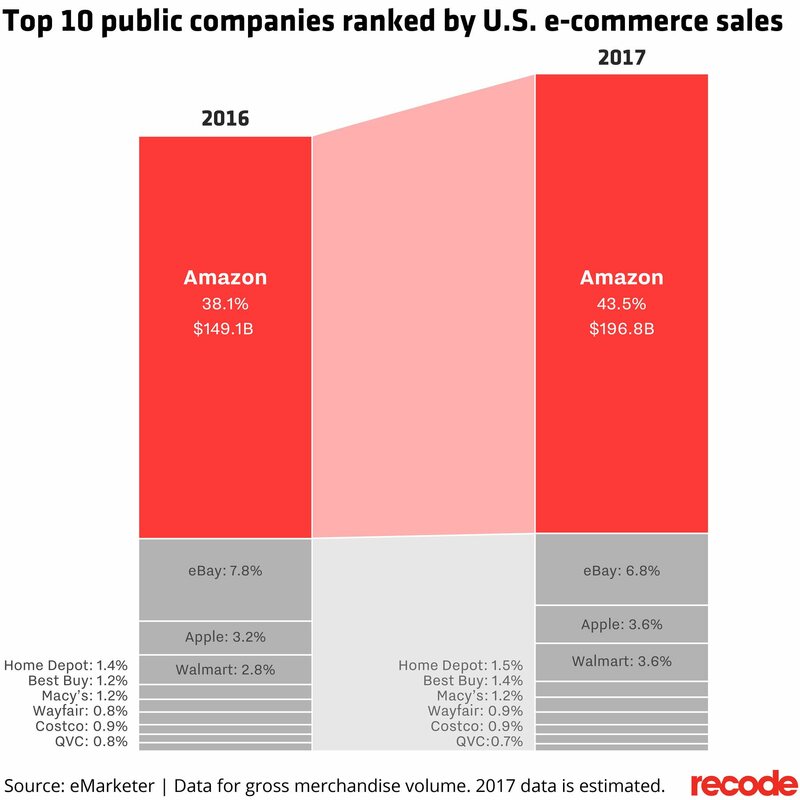 Half of Amazon’s sales are from the marketplace, all of eBay sales, all of Etsy sales, plus some Walmart and Jet.com, and then all privately run marketplaces like Wish.com all add up to roughly 33%. A third of US e-commerce comes from marketplaces. This is bigger than Amazon itself. And roughly equates to $150 billion, the size of all marketplaces combined (based on The Census Bureau of the Department of Commerce e-commerce sales estimates). This pie gets shared by millions of sellers across all the different platforms. Around the world marketplaces are disrupting all industries. From Uber and Lyft for taxis, to AirBnB for hotels. In retail there are leaders like Amazon, and Alibaba, but then there are interesting developments like 1stdibs.com which focused on luxury and antique goods, unfit for the Amazon model. It is a marketplace too. Retail for thousands of years was built on friction, meaning physical stores, geographical boundaries, slow transportation times, etc. All of those friction points are gone, resulting in retail which is fully global, and available everywhere all the time cheaper than before. Marketplaces is that. And that’s why we think they will continue to grow, and “traditional retail” will continue to struggle. For the sake of context, given the rough estimate for the size of all marketplaces in the US of $150 billion, it is the third-largest online retail market in the world. As in, it is as big as all of UK online retail, which is the third largest e-commerce market. A market created mostly by Amazon and eBay is larger than any online retail market but US and China.